Use of the Cloud is optional but can help improve performance for some protocols. WARNING: When using the Cloud, care must be taken to terminate your cluster after completion with vp-terminate-cluster to avoid excess usage charges. To use the Cloud, the CloVR VM must be configured with a set of credentials using the vp-add-credentials command. A credential will be created that can be referenced using the value set in the “cred-name” parameter and can be used across multiple pipeline executions. Troubleshooting: For this command to work the “keys” folder has to be mounted correctly. 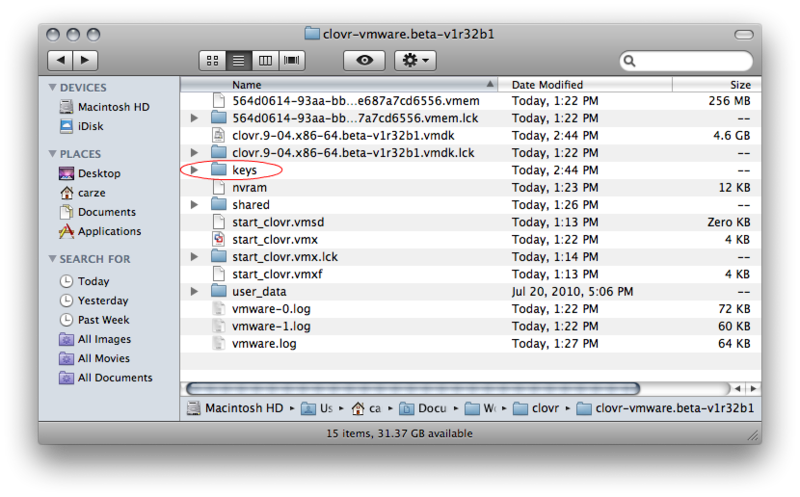 Check with “ls /mnt/keys/” if the contents of the “keys” folder are accessible from within the CloVR VM and use the Troubleshooting pages for Virtual Box or VMware player to set up shared folder.